A dense whirling mass orbiting what almost certainly is a black hole of truly Brobdingnagian proportions has been discovered at the heart of an active galaxy some 21 million light years from Earth. The astronomical observations were made by an international team of Japanese and American astronomers using a continent-wide radio telescope funded by the National Science Foundation. The work is reported in the January 12th issue of Nature. The tremendous concentration of mass, equivalent to 40 million suns, in the center of the galaxy NGC4258 in the constellation Canes Venatici, was revealed by the apparent rotation of a molecular disk that surrounds it. The observations showed that the disk of dense material is orbiting within the galaxy's nucleus at velocities -- up to 650 miles per second -- that require the gravitational pull of such a massive object. 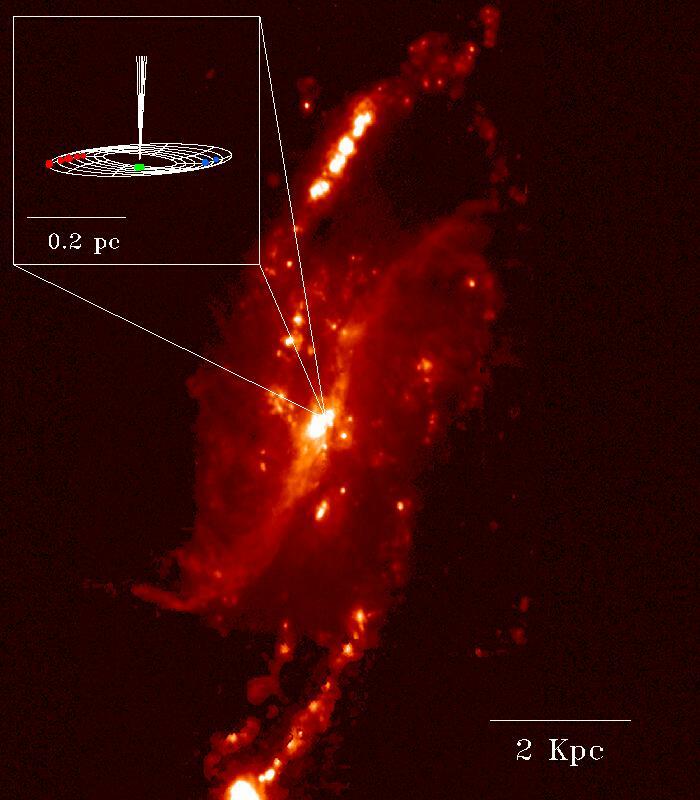 The high angular resolution and sensitivity of the Very Long Baseline Array of the National Radio Astronomy Observatory allowed precise measurements of the differential rotation of the material in the disk, which provides the most direct and definitive evidence to date for the presence of a supermassive black hole in the center of another galaxy. Black holes, so dense that nothing -- not even light -- can escape their gravitational fields, have long been thought to be present in the centers of active galaxies, where they would act as central engines driving a variety of exotic and energetic phenomena that are seen on much larger scales, such as jets and powerful X ray emission. NGC 4258, a spiral some 90,000 light-years across, is known to have jets of gas that are twisted into the shape of a helix emerging from the nucleus at speeds of 400 miles per second. Makoto Miyoshi of Japan's Mizusawa Astrogeodymanics Observatory; James Moran, James Herrnstein and Lincoln Greenhill of the Harvard-Smithsonian Center for Astrophysics in Cambridge, MA; Naomasa Nakai of Japan's Nobeyama Radio Observatory; Philip Diamond of the National Radio Astronomy Observatory in Socorro, NM; and Makoto Inoue, also of Nobeyama, presented their discovery today to the 185th meeting of the American Astronomical Society in Tucson, Arizona. "The beautiful definition of the motion in the disk and its structure, and the high density of the central object -- at least ten thousand times that of any known star cluster -- convinces us that this must be a black hole.'' says James Moran. "The dynamics of the disk are fairly simple, and we suspect it may offer us a laboratory for measuring a host of other fundamental phenomena in astrophysics.'' Miller Goss, assistant director of NRAO for VLBA/ VLA Operations comments, ''this is a sensational result, showing the excellent science that comes from skilled use of the highest- resolution instrument available to astronomers... It's particularly nice to see such valuable contributions coming from the early use of the VLBA." The team of astronomers used the VLBA to study a disk of molecules deep within the nucleus of NGC 4258. The disk, tiny compared to the galaxy, contains heated water molecules that amplify microwave radio emissions in a manner similar to the way in which a laser amplifies light. The disk is oriented fortuitously so that pencil-like beams of microwaves are directed toward the earth. These powerful naturally-occurring microwave amplifiers, called masers, were discovered in the galaxy in 1982. In 1992 Nakai, Inoue and Miyoshi, using a radio telescope at Nobeyama, Japan, made the surprising discovery that some of the masers had very high velocities with respect to the galaxy. The large apparent velocities they observed could not be accounted for by the galaxy's normal rotation. At that time, the Japanese researchers suggested that the masers might be orbiting a black hole. Research by Greenhill and colleagues, using the technique of Very Long Baseline Interferometry (VLBI), provided preliminary support for this hypothesis. The VLBA, an instrument built specifically for VLBI, now has confirmed the hypothesis and allowed astronomers to paint a surprisingly clear picture of activity in the depths of this galactic nucleus. Since microwaves are not attenuated by the gas and dust that naturally lie in galactic nuclei, radio astronomers are able to look more deeply than are optical astronomers. The astronomers calculate that the density of the central object is at least 100 million solar masses per cubic light-year. If this mass were in the form of a star cluster, the stars would be separated by average distances only somewhat greater than the diameter of the Solar System. Such a cluster could probably not survive the inevitable collisions between the stars, leading to the conclusion that the central mass is probably a black hole. The mass density estimated to lie in this central region is at least ten times greater than that of any other black-hole candidate. "The properties of this disk provide compelling evidence for the presence of a massive black hole," the astronomers wrote in their paper in Nature. Independent measurements, made at the Haystack Observatory and at the Max Planck Institute for Radio Astronomy in Germany, of the gravitational acceleration of the masers as they are swept along in the disk also allowed the astronomers to determine the distance to the galaxy with greater precision than had been done before. Previous estimates of the galaxy's distance ranged from about 11 million to nearly 23 million light years. Incorporating these VLBA observations, the astronomers obtained a distance estimate of 20.8 million light years, plus or minus 4.2 million light-years. This direct geometric distance estimate provides an important reference point in the ongoing work to measure the size and age of the universe. The group will continue to observe the disk over the next few years with the VLBA. Inoue comments, "We predict that the masers should move relative to one another by about 35 microarcseconds in one year. The rotation should be clearly evident with the tremendous angular resolution of the VLBA. This will allow a precise trigonometric determination of the distance to the galaxy, as well as a detailed look at the orbit of the molecular disk." The VLBA observations were made at a radio frequency of 22 GHz. The VLBA, dedicated in 1993, is a system of ten 82-foot-diameter (25 meter) dish antennas located across the U.S. from Hawaii to the Virgin Islands. All ten antennas work as a single instrument and are controlled from the NRAO's Array Operations Center in Socorro, New Mexico. The VLBA is providing astronomers with unprecedented opportunities to make routine, high- quality radio observations. For the observations of NGC 4258, the VLBA was joined by the Very Large Array (VLA), a 27-antenna radio telescope in New Mexico. The VLBA and the VLA are facilities of the National Radio Astronomy Observatory, operated by Associated Universities, Inc., under cooperative agreement with the National Science Foundation. Moran said that the VLBA correlator, the special-purpose processor that combines the data from each telescope and forms the heart of the multi-antenna radio telescope, "is at least 50 times more powerful than any previous correlator. It is really awesome to see the data zip through the correlator. As a system, the VLBA represents a major advance for the field in terms of data capacity, sensitivity, dynamic range and ease of use." The galaxy NGC 4258 is also known as Messier 106, and is visible in moderate-sized amateur telescopes in the nighttime winter sky of the northern hemisphere, near the Big Dipper. An optical image in H-alpha light of the central part of NGC 4258, which shows jet-like structures emerging from the core on a scale of a kiloparsec (3260 light-years). The inset shows the newly discovered molecular disk that contains water vapor masers. Their velocities are color coded (blue for approaching, red for receding and green for stationary with respect to the galaxy) and define nearly perfect Keplerian motion around an unseen object of 40 million solar masses. Optical image courtesy of Gerald Cecil and Holland Ford.